When visiting Brussels, Belgium we seized the opportunity to take a day trip to Bruges! Read on for our sightseeing itinerary and map packed full of everything we could find to see and do in this beautiful city. We explored several cities in Belgium (Bruges, Antwerp, Ghent, and Brussels!) from top to bottom and couldn’t fit it all in just one article. 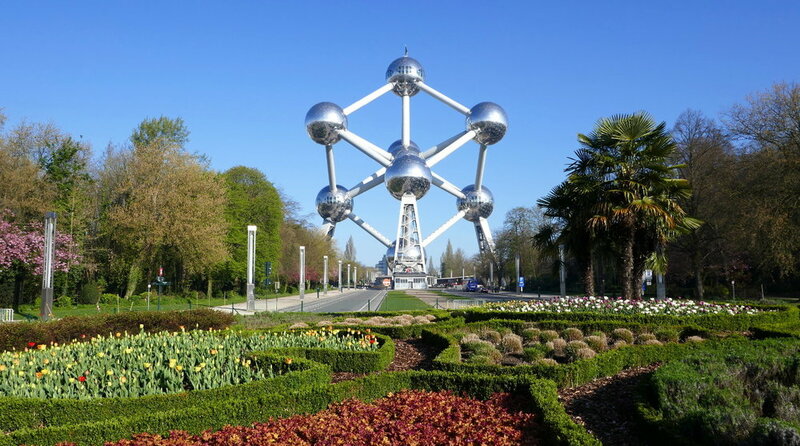 Be sure to read the rest of our Belgium City Guides! Our home base, if you will, was in Brussels, Belgium. From there we took three, one-day trips to cities outside of Brussels and then spent two days sightseeing in Brussels. All of the cities (Bruges, Ghent, and Antwerp) were small enough that upon our arrival we didn’t need to take public transportation, although it was available if needed. In preparation for visiting Bruges and wanting to make the absolute most of day trip, we created a comprehensive sightseeing itinerary, researching all the destinations we could find. So, to possibly make your research on sightseeing in Bruges (and other destinations) easier, we’ve kept our maps with all of the information we gathered (accurate at the time of our sightseeing). Finding hours, prices, and general information can sometimes be challenging, so we’ve tried to include these details on our maps and provide appropriate links below. We encourage you to explore the map below, copy it to your Google account, and make the map your own. It’s a fantastic resource to have on hand when touring the city! NOTE: We used this sightseeing map for our personal sightseeing adventures, because of that some notes may not make perfect sense, and some information could be outdated. Information on this map was valid at the time of creation. All prices are shown in US dollars but are actually Euros (local currency). That being said, feel free to save it to your Google account and use it as a starting point (or modify it accordingly) for planning out your personalized itinerary in Bruges, Belgium. London, San Francisco, Paris, New York City, Athens and more?! Trusted Housesitters has allowed us to travel the world on a budget, but more importantly given us an opportunity to make new friends and have cute and cuddly companions along the way. Sign up and start your next great adventure! Through the grapevine, we’d heard that Bruges was a beautiful city. Well, within minutes of stepping off the train and walking through the city, we understood why people visit Bruges! Just a short walk from Station Brugge, train station is Minnewaterpark. The park is covered in paths, trees and beautiful scenery, and is well worth the time to explore. Be sure to have your camera ready, because it’s a very picturesque walk. In the center, you’ll come across a rectangular lake, Minnewater, although it’s better known as the Lake of Love. Legend has it, that if you cross the bridge with your partner, you’ll share eternal love. Bruges, Belgium. Clockwise (from the top left): Us on the bridge over the 'Lake of Love' at Minnewaterpark, Smedenpoort Gate, Windmills, view of Church of Our Lady from Nieuwstraat street. There are four remaining medieval town gates in Bruges and they’re part of what remains of the defensive walls that were built in 13th through 16th centuries. The gates are on the outside of town and are connected by a greenbelt that encircles the old city boundary, known as the canal path Kruisvest. So, from Minnewaterpark, head northeast. You’ll want to make your way to the foot path along the canal. It’s a path used by many walkers and joggers in the area. Go first to Gentpoort (Gate of Ghent) and then continue on the path to make your way north to Kruis Gate. For a longer walk, continue along the path to make the full circle around Bruges. However, at Kruis Gate we made a turn west and walked through the city to the next gate. It was a nice detour that gave us a good look into the city beyond the normal tourist spots. We made our way through the twists and turns of the city to Ezelpoort Gate, known also as Donkey’s Gate. We then completed the tour of the gates by going south to Smedenpoort Gate. In our opinion, the gates are interesting to see, but not as picturesque as we’d imagined. Probably because they’re now used as roadways for vehicles. Tip: If you’re up for the walk to all four, we recommend it, especially on a clear day. However, if you want to reduce the walking, we’d suggest going to the first two gates (Gentpoort and Kruis), seeing the first two windmills and then cutting back into city center. There used to be 25 windmills in Bruges. However, there are now only a few left. The best way to see the Bruges Windmills is to visit them on the Kruisvest canal path while touring the four town gates. The four windmills are located just north of the second gate, Kruis Gate. The first mill on the path is Bonne Chieremolen, built in 1844 in the village of Olsene and moved to it’s current spot in 1911. The next mill on the walk is Sint Janshauimolen, built in 1770; it's unique in that it’s the only mill still located in its original spot. The third windmill, De Neuwe Papegaai, was built in 1790 as an oil mill and was moved to it’s current location in 1970. The fourth mill on the canal is Koeleweimill, which was built in 1765 as a corn mill in Meulebeke. The windmills give a feel to the town that's very unique! Also, Sint Janshauimolen mill and Koeleweimill are open to the public and Koeleweimill has been made into a small museum. From the last Medieval Town Gate, make your way back into city center where you'll want to stop at St. Salvator’s Cathedral. The cathedral dates back to the 10th century, although, it wasn't made a cathedral until the 19th century. You'll especially want to see the loft organ and the tapestries in this cathedral! The cathedral closes from 1-2 pm (accurate when we visited), so plan ahead. After St. Salvator’s Cathedral, we recommend going to the Church of Our Lady. Taking nearly two centuries to complete, this cathedral dominates the skyline! The cathedral is undergoing renovations until 2018, but is still open for visits. The church is free to enter, but there isn’t much to see unless you pay the entrance fee of €6.00 for the museum. If you’re a fan of Michelangelo’s famous Madonna and Child sculpture, then you’ll want to purchase entry to the museum! Don’t miss our Ultimate Gear and Packing Lists! Whether you’re traveling long-term or going on a short vacation, we'll show you how to travel with a single carry-on. We share our packing lists (his and hers! ), packing tips, and our favorite gear. Plus, we discuss what we don’t carry and why! After admiring Michelangelo’s Madonna and Child sculpture, make your way to the heart of Bruges. Markt, also known as Market square, is a popular square in the center of Bruges. Cafes surround the outside of the square and on a sunny day, it’s a great place to get breakfast, lunch, or coffee and a snack. Since the renovation in 1996 you won’t find many cars at Markt, and you'll probably find horse drawn carriages instead! Belfry of Bruges – A medieval bell tower that once was used as an outlook to spot fires and dangers in Bruges. Climb the 366 narrow steps to get the best views of the city. If you’re taking a picture of the tower from Markt, don’t spend too much time trying to align it, as the tower leans nearly three feet to the east! Hours and ticket prices can be found on the Visit Bruges website. Gallery XPO Salvador Dali – Next to the Belfry you’ll see the Salvador Dali museum. If you’re a fan of surrealism or cubism, this is a great place to visit. Find visiting information, including hours and ticket prices on their website. Provinciaal Hof – A Neogothical building on the east side of Markt that’s hard to miss. The intricate architecture is likely to get this building in a few of your pictures. It was used as a governmental meeting place until 1999. Bruges, Belgium. Clockwise (from the top left): View from the top of Belfry of Bruges, Provinciaal Hof, panorama of Markt square, opposite side panorama of Markt square, view of Markt square from the top of Belfry of Bruges. Right around the corner from Markt you'll find Burg Square. It’s not as big of and as popular of a square as Markt, but it’s home to some of the most beautiful buildings in Bruges. City Hall – Known as Stadhuis, Bruges City Hall was built in 1376. Explore the museum for a view into the history of Bruges. Hours and ticket prices. Liberty of Bruges – Known as Brugse Vrije, this building is next to city hall. It functioned as a courthouse from 1795 to 1984 and is now home of the cities archives. Tickets for city hall include entrance to Liberty of Bruges. Visitor information can be found on their website. Basilica of the Holy Blood – This 12th century basilica is beautiful on both the outside and the inside. We found the interior to be different from many of the other churches we’ve visited across Europe. It’s small, but the detail, color, murals, and wood ceiling are gorgeous. The basilica is free, but the museum has an entrance fee. Of note in the museum is a piece of blood stained fabric that the Catholic Church considers to be stained with the blood of Jesus Christ. Visiting hours and museum ticket prices can be found on the Holy Blood website. Burg Square is where the city was first inhabited in the second and third century. So, it’s no surprise that this is where you’ll find a treasure-trove of Bruges history! What better way to end a day of sightseeing than by resting your tired feet and taking a canal tour? During the day you’ve probably seen the charming canals lined with picturesque homes and buildings, but you don’t want to miss the views from the water! After Burg Square, head southwest towards the canal to find a tour company in operation. At the time of our visit, a 30-minute tour in a small boat was €8. More information can be found on the Visit Bruges site. Bruges, Belgium. Clockwise (from the top left): View of intersecting canals, view down the canal towards Jan van Eyck Square ornate interior of Basilica of Holy Blood, Burg Square and city hall, looking down the canal. With only a day in Bruges, we were glad to have seen so much of the city. It truly was a beautiful city, with sights that seem to come straight from a fairy tale!